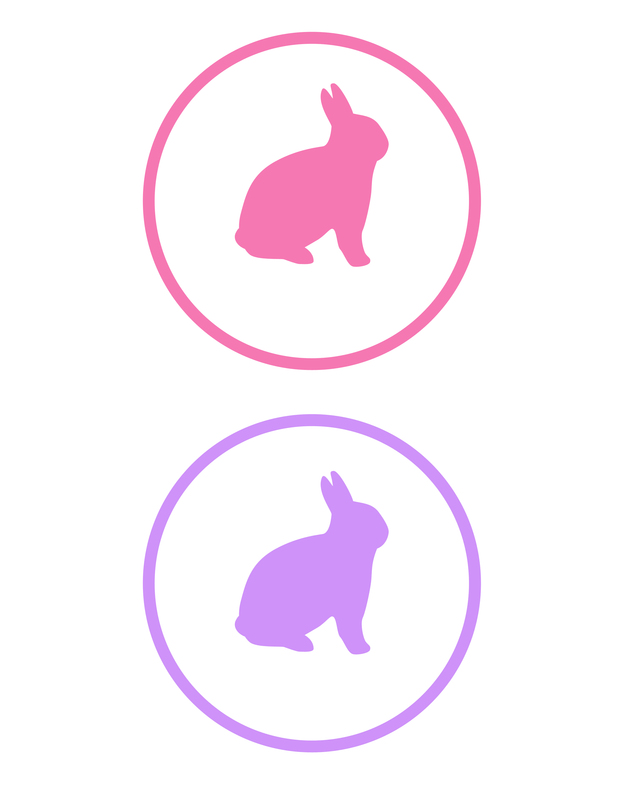 My bunny tags & cards match these too! 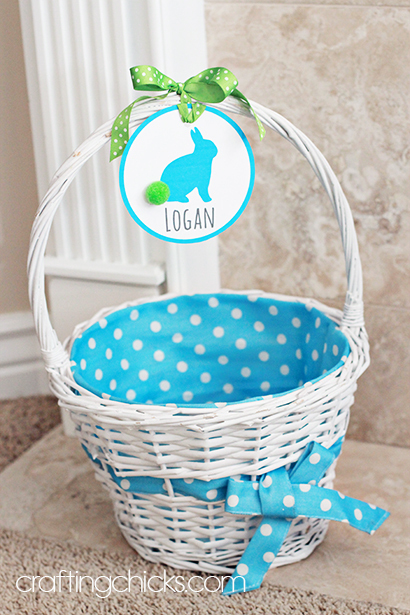 Love how the sweet pom pom tail looks on the Easter Basket Name Tag! 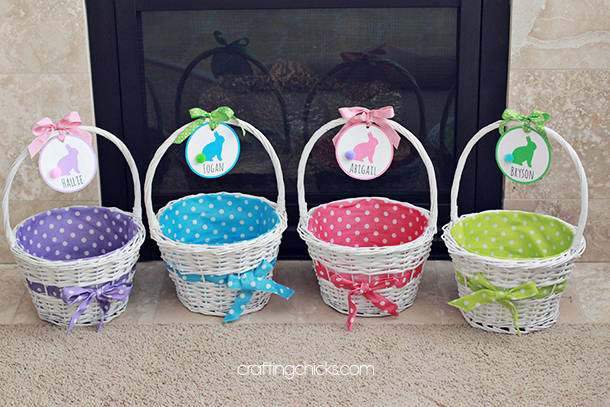 Many friends have asked where I found these adorable polka dot easter baskets…and I found them at Walmart! I was so surprised to find such cute ones there. 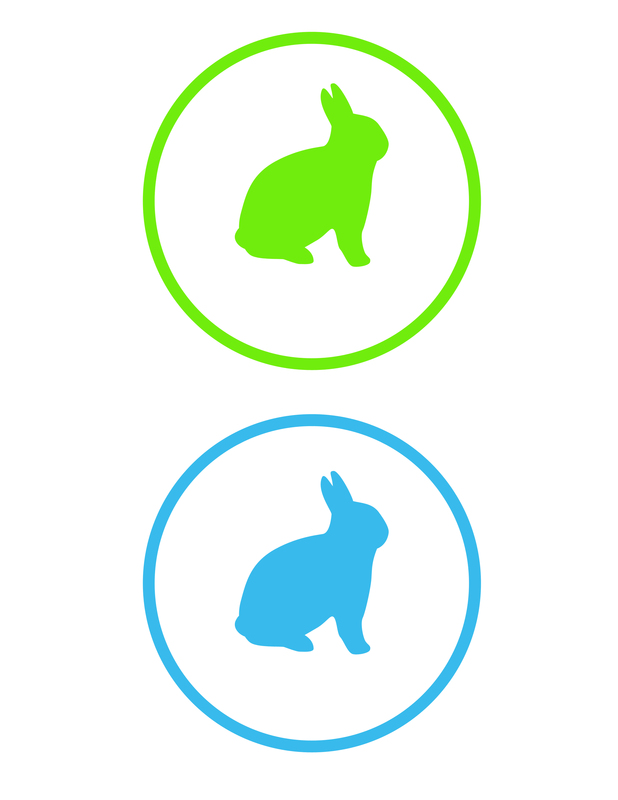 I love that they had 4 different colors…purple, pink, blue and green. They even came in a few different sizes. 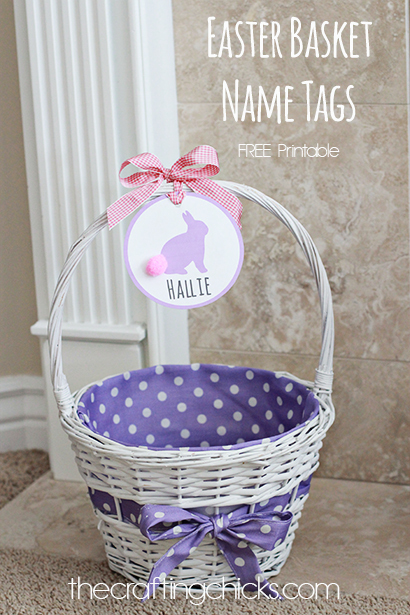 Just tie on the Easter Name Tags with ribbon. All printables and downloads designed by The Crafting Chicks are for PERSONAL USE ONLY. Please do not alter or claim as your own. This file is not intended for resale, nor are the printed versions of this file. 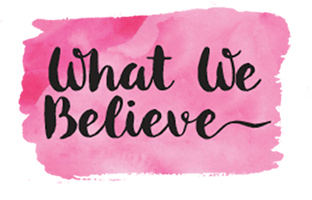 Feel free to link back to www.thecraftingchicks.com if you like our printables, and we’d appreciate a comment if you download. 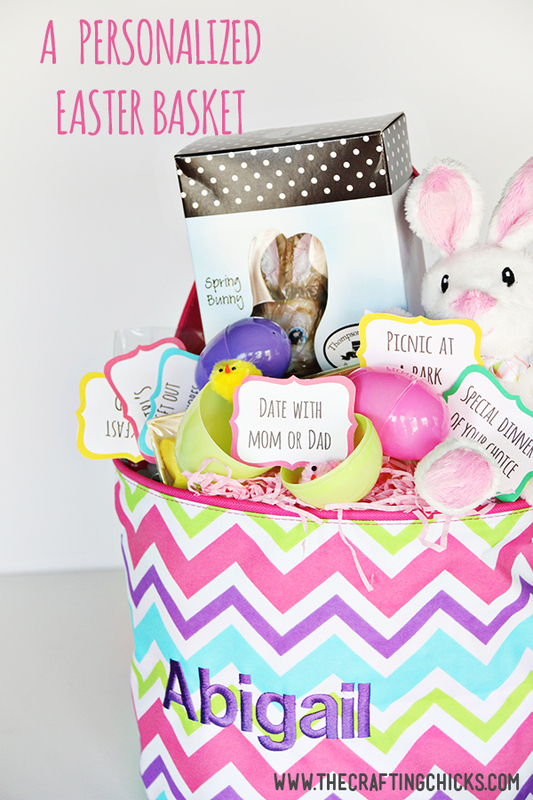 These cute Easter Basket coupons are great to print and hide in those eggs. Much better than toys or candy. These coupons have fun ideas for outings, activities and dates with your kids. 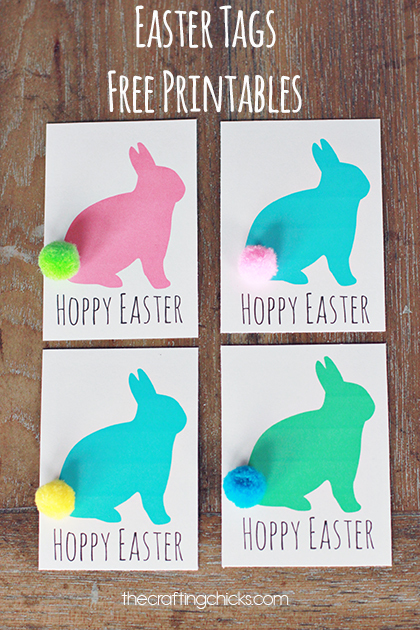 These “Hoppy”Easter tags are fun to add to any spring or Easter treat. 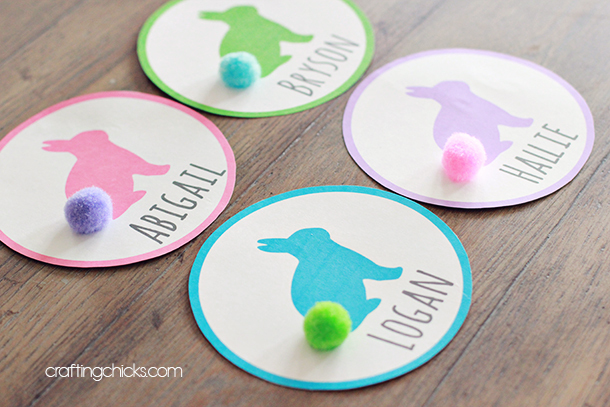 Share with your loved ones after printing, cutting, and gluing on a pom-pom tail. 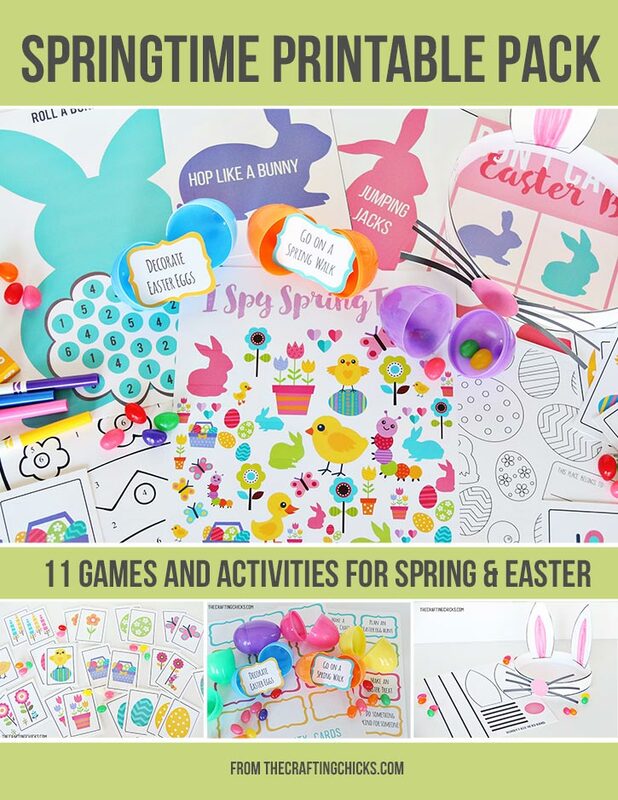 The cutest springtime/Easter activity pack to do with your family! Just click print to be the hero of Springtime! Super cute! Using these for our Easter Egg hunt! I like these! Where did you find your Easter baskets? So cute! Where did you find the baskets? LOVE these. Just finished tying them on to our Easter Baskets. Thank you so much for the print out! i would love to use these this year but the download link isn’t working. 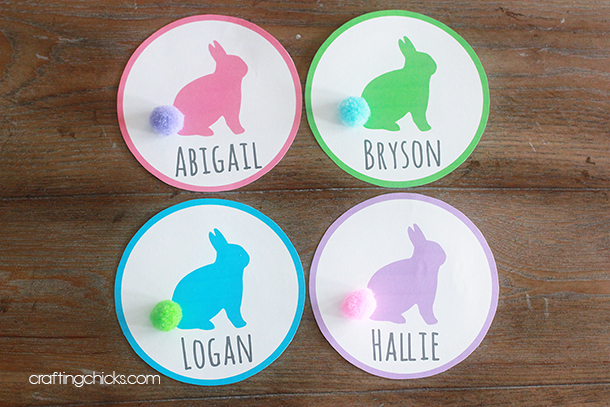 I’d love to download the bunny name tags because they are exactly what I need – but I’m unable to do it. Help please!!! I’d love to use these this year as well!! Is there any way you can email them to me? Or put up a new link? I would like to download the mini basket tag but I am having difficulty. I need 12 tags. I was put in charge from my mom in law to bring name cards for easter and these are awesome. Can someone send me a useable link. I can’t seem to be able to download the name tags. Am I doing it wrong? I can’t dl them either…PLEASE help….!!!!!! I cannot locate a link to download. Can you please email it to me? thank you! I LOVE the tag, but can not download link:( can u please give us a new link:) thanks! Please help! Cannot locate the link to download like other viewers. Can you email it to me? thank you! I’m unable to print these out. Can you send to my email? I can’t download these and would love to, Help please! 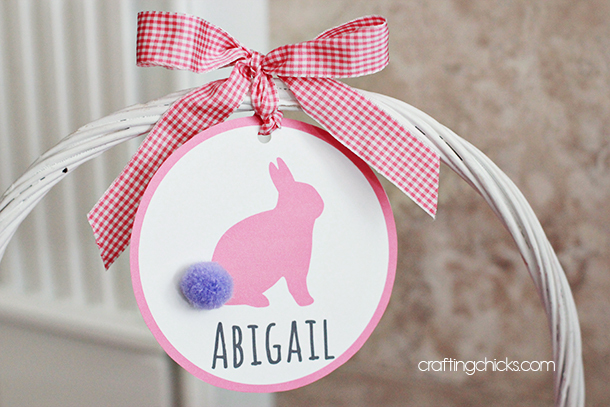 We would like to download this adorable bunny name tag, but unable to access link! Would you please email the link to the above address!? Please help we are unable to download as there is no link….do these comments go through to anyone? Fell in love this these after following a link from eighteen25girls on instagram. I wish the link was working but it looks like I’m not the only one having issues. I’ll bookmark and keep checking because these would be perfect for my kids baskets! I would love to download these!! Can you please make them accessible??? Oh man. I’m sorry they aren’t there. Let me see what we can do. Thanks for trying to get these back up! I will continue to check back!! Hope you are able to make them available again, they’re SUPER cute!!! Have you had any luck working out how to fix download? Would love to print, they are very cute! i would also love to download them ~ please!!!! there is no link, please add!! What font did you use? Its so cute!